These Pet Rescue level 226 cheats and tips will help you beat level 226 of Pet Rescue. The objective of Pet Rescue level 226 is to save 5 pets and get 13,000 points. Pick a side in Pet Rescue Saga level 226 and begin to open it up. 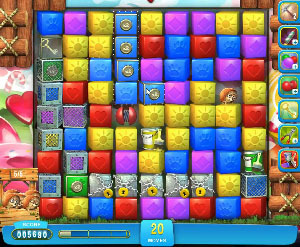 You will need to free the blocks from their layers and cages by making simple matches to the side of them. This will be very important for tip number two. You need to bring a line blast down from the top to the bottom of this level, and it needs to be to the side of the pet carriers. When then, tap it and it will clear out the entire row, thus freeing the entire amount of needed pets. Looking for more points? Use the paint cans in this level to turn regular blocks into bonus blocks. All you need to do is paint over blocks that already match the color of the paint can. Bonus block matches are a great way to quickly increase your point total.